Why more people don't make the pilgrimage down Delaware Avenue for their midday meal is beyond me. 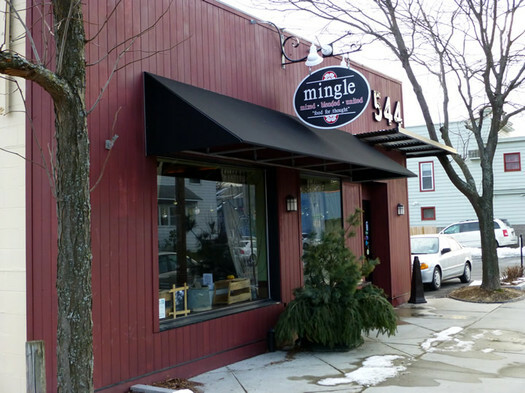 Mingle has a parking lot, and a perfectly relaxed lunch took the sum total of 40 minutes. Plus, at lunchtime, their Dukbokki is only $10, a steal compared to the $21 charged at dinner. It's also cheaper than a similar dish at Kinnaree down the road that goes for $12. But the value in this food isn't how much it costs, or how much is on the plate (which is more than ample, for lunch or dinner). The value is in the sensory experiences of what they put before you on the table. When this gorgeous dish of garaetteok -- rice cakes made from steamed rice flour and shaped into a long white cylinders, like a solid round noodle -- encrusted with crimson red pepper paste, and tossed with sauteed vegetables and sesame oil arrives, the deep and complex aromas of the dish perfume the air. 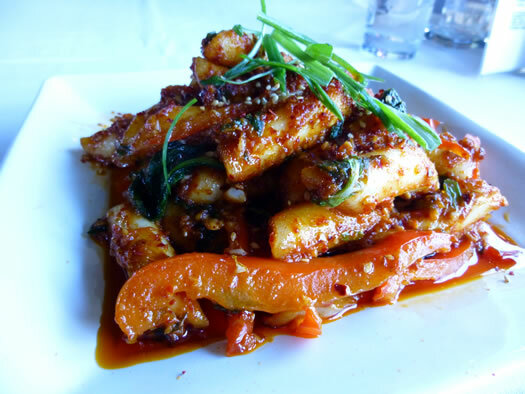 Without a doubt, the star of this dish is the traditional Korean red pepper paste, gochujang. The chewy and toothsome rice cake offers up a comforting texture and neutral flavor that serves simply as a vehicle for the lustrous red pepper paste. The finely julienned vegetables offer a more efficient way to mop the gochujang into your mouth. 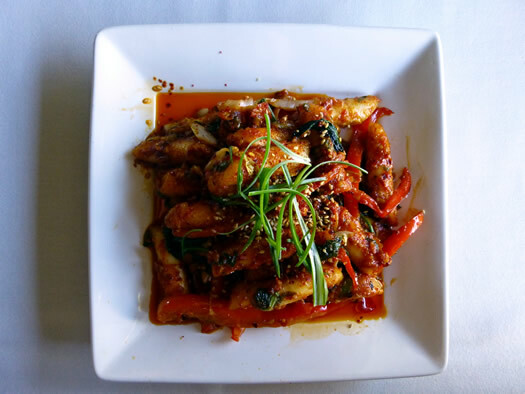 The sauteed red peppers serve as a sweet and juicy contrast to the deep and concentrated red pepper that permeate every bite. 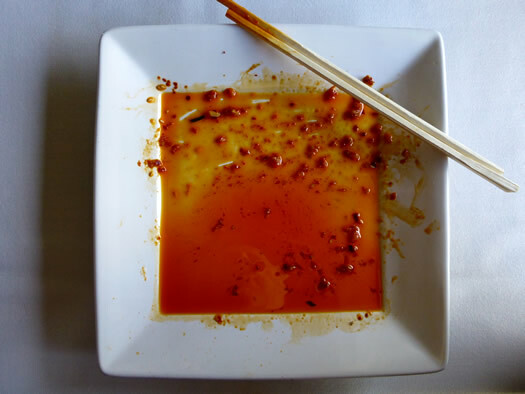 Chef Un-Hui Filomeno was born and raised in Korea, and she makes her own gochujang. I spoke with her son Jose, who is one of the three owners of Mingle, asking for the secret to what makes it so good. He explained, "She learned it as a girl as Korea and kept it with her for the past 55 years." Still, without a doubt, dukbokki is street food. I asked Jose about this too, serving these very delicious if humble foods in such a fancy setting. He said, "The fine linen napkins and tablecloths? This food deserves to be eaten off that." And given its quality, I'm inclined to agree. At the nudging of their neighbor, All Good Bakers' Britin Foster, Jose led the the charge at Mingle to start bringing in produce from the Honest Weight Co-op. They are also using Buckley's grass-fed beef in their Korean tacos, bulgokee and chap chae. Occasionally Jose explains he will run a DelSo burger special that uses beef from Tilldale Farm, which sells their products alongside The Cheese Traveler next door to Mingle as well. He said the switch was a "very scary thing to pay more for the product, not sure if the public wants it. But it's a leap of faith." Still, it was something that Jose personally believed in, and from a business perspective it seems to have paid off. With quality ingredients, time-intensive preparations, nice table settings, and well made classic dishes, Mingle is delivering on a lot of levels. The only shortcomings at lunch were the cheap wooden chopsticks and the lack of banchan (traditional side dishes served in Korean cuisine). But Jose is on top of this, and has plans to introduce a bunch of cold Korean side dishes on the summer menu and replace all the nice chopsticks that perpetually seem to disappear. Although with the strength of their gochujang I wonder if chopsticks are really the best utensil. I was seriously tempted to eat this dukbokki with a spoon. So this dish is vegetarian? Seems so based on the listed ingredients. I'm always looking for new and exciting veg fare at local restaurants. I just had lunch, but the picture made me want to hop on my car and drive to Albany. I frequently say Jose is "The Nicest Guy in Albany". He's been so welcoming to us and he's got such a giving, honest spirit. I bet he'll have those chopsticks changed in no time. The fact that he took the jump to using a bulk amount of local ingredients says a lot about him - he supports our community and wants the best for his customers. It's harder for a restaurant with a lot of volume to do so, but he laid the bricks and made it happen. We are huge fans, to say the least! Got the tacos there once, the filling was delicious ( a touch on the salty side, though), but crappy, store-bought corn tortillas enveloped the filling, They detracted from the taste so much I ended up trashing the tortillas and eating the filling on its own, though I could still taste that pasty flavor. I was not happy and for that price, they should make their own or find a source locally who can make them using fresh ingredients or they should just not make tacos. I haven't been back since because it is not cheap there and it makes me wonder where else they cut corners. Would love to have a reason to give it a try again. That looks like some fancy dukbokki. Ten dollars seems to be a steep price for something that in Korea usually sells for a dollar. With that said, the homemade gochujang and julienne vegetables look fantastic. In Korea, the stuff is mainly eaten by young kids during lunch break out of paper cubs with toothpicks, or after school at food carts/stalls set up right outside the schools (usually also selling alongside steamy vats of Odeng - fish spam on a stick). Very interesting to see it presented as as a legit entree in a fine dining restaurant. I will have to make a trip there soon. Daniel B's description sounds great, and the photos look great... but I'll probably never go here. Where's the lunch menu on their site? All that's online is the dinner one. Oh look, Bi Bim Bap for TWENTY TWO DOLLARS. How does something like that dish or the Dukbokki described above change from lunch to dinner? Portion size? Is it possible to get a lunch size at dinner? Takeout? Laura - The first time I had the tacos, I had the same exact experience as you. Other times, the tortillas have been spectacular. One of the exciting things about Mingle is the Asian burger they serve for lunch. It's basically the same idea as the tacos (boldly marinated beef, same "taco" sauce, Kimchee "pickles") with excellent quality Tildale Farm ground beef and on a ciabatta roll ($10). I've gotten that multiple times and have never been disappointed with it. @mg - Yes, it's spicy. But it's more of a smoldering slow burn than a conflagration. There is heat to the dish, but it's more about flavor than fire. @Paul - The difference is portion size. For me, the lunch portion would be totally sufficient for a filling dinner. It would be lovely if Mingle offered that option in the evening. @DerryX - On the menu, those items that use grass fed beef are clearly called out. I confirmed with Jose that in fact the Asian burger is not made with Tildale Farm ground beef. Occasionally Mingle will offer a special DelSo burger made from Tildale's product, but it's not on the regular menu. derryx, thanks for the tip. Hmmm, I think I'll give Mingle another try. I know the hubs really liked their wings. Looks great, but you forgot to include a picture of how messy your face was at the end. Read this article and the photo just screamed at me. For two days it had been on my mind, that I need to try the "Dukboki" at Mingle. Last night, after work I gave a call over and placed an order for take out. It was indeed the dinner portion, so I paid the premium price rather than the lunch menu. What a great adventure! From beginning to end. The hostess was so nice and welcoming (I often wonder where customer service went these days. But it is not missing at all at Mingle). The bartender: Super friendly. Top notch service from staff all around. Taking my Dukbokki home - it was simply a treat. Flavors and textures that I had never before experienced. Some heat, but it is really a low warm glow kind of heat. The texture of the rice cake (a kind of chewy that is just goodness) is just the type of thing that makes me want to finish the whole plate . . but I can't cause it was huge. Thank you Daniel for always providing photos that make me explore Albany, as if it was a Safari. It somehow make eating fun again. Love the food, & the staff...Mingle, is a great addition to a great neighborhood!! !